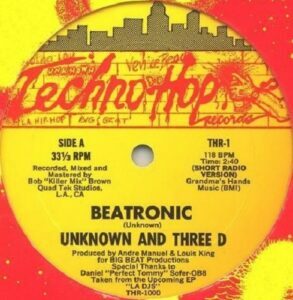 “Beatronic” was the product of a collaboration between West Coast hip hop pioneers The Unknown DJ aka Andre Manuel, Louis King aka DJ Three D (R.I.P.) 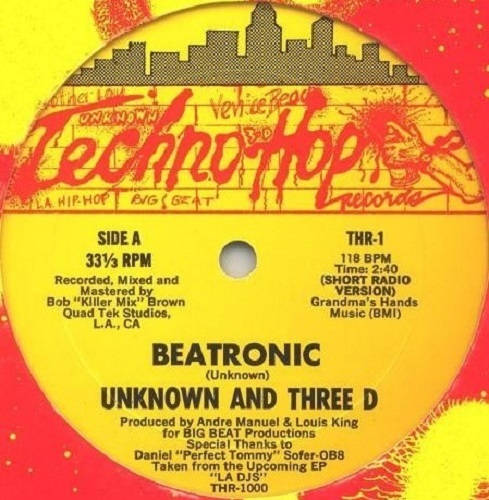 and Daniel ‘Perfect Tommy’ Sofer and was the debut release for Techno Hop Records. I contracted Daniel who was at the time a local studio musician and Oberheim Electronics employee. Daniel would bring his rig (A DMX drum machine, DSX sequencer, and OB-8 Synth) to the studio for an hourly rate and help fledgling musicians and producers such as myself and Louis to get their songs recorded. 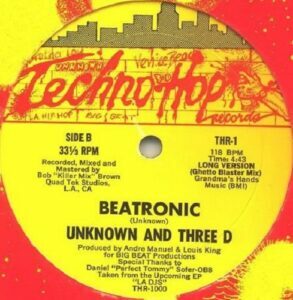 As I recall, I programmed the drums and came up with the bass line and a simple melody at home on a Sequential Circuits Drumtracks drum machine and a Sequential Circuits Six Track keyboard with a program called Dr. T’s midi sequencer on a Commodore SX-64. In the studio we reprogrammed the song on the Oberheim rig and Daniel elaborated with his superior chord structures and arpeggiated the melody and generally did the magic that Daniel does…..made it sound more structured and layered. The drum sounds themselves, prior to the recording of Beatronic, were custom made by Daniel and myself for inclusion in a for sale set of Oberheim Electronic Eprom Drum Chips for the DMX and DX drum machine which may have been called (Memory is fading) the “Orchestral Big Beat Set.” We sampled from turntable vinyl to a queen size mattress standing sized eprom burner and tweaked and mixed the samples to come up with the kick, snare, scratch sounds. backwards snare-clap there was also an orchestra hit you hear in a lot of songs of that time like 808 Beats that we didn’t use on Beatronic. 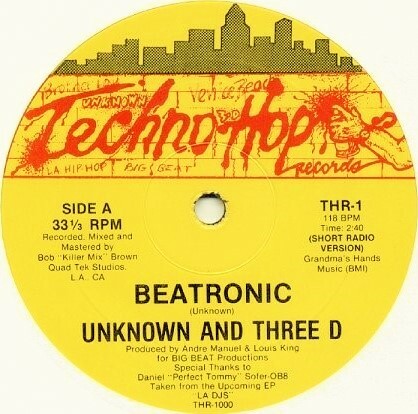 The track was a slow burner in the US to begin with but sold well overseas. Once the breakdancers of New York picked up on it though, things soon changed. There are a couple of label variations which are pictured below but the track listing is the same on each. Variant with smaller, bolder font.